Loaded boards are considered among the best longboards out there. They are high-end boards with high-quality, innovative, and durable materials and construction. They have advanced shapes and features for very technical and progressive riding. Longboarders commonly wish they owned a Loaded. Whether you’re an experienced or newer (but passionate) rider, you may be attracted to these advanced products. Buying a Loaded board, however, can be a hefty investment as they sell at a premium price. Thus, you want to make sure you choose the right board for your needs. What is(are) your primary riding style(s)? What is your preferred mount style? What is your ideal board size? What kind of shape do you need? What is the optimal component configuration for you? 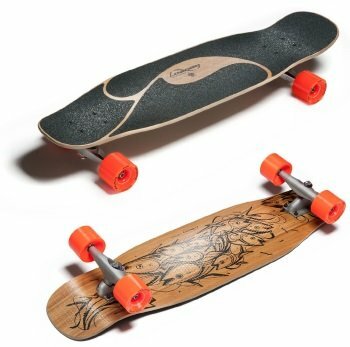 Merely listing the Loaded longboards and their characteristics would not be very helpful in making the right decision for you. In this article, my aim is to help you sort through the board features in the Loaded lineup so you can figure out the best-suited Loaded longboard for you. 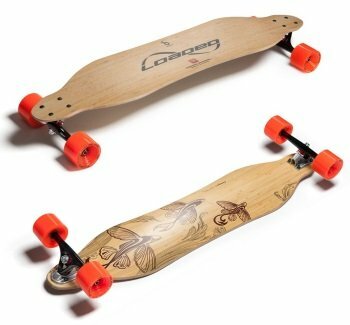 Why choose a Loaded longboard? Such feedback is heard over and over again. On the flip side, some riders sometimes complain about the higher prices Loaded boards sell at compared to other serious competing brands e.g. Landyachtz or Arbor – this sometimes even lead to occasional negative feelings against the brand. 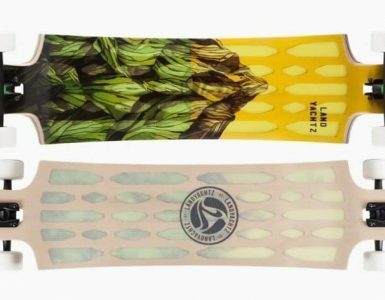 Advanced pressing process that leads to sophisticated shapes with special concaves and contours for the right balance of foot cradling, freedom of movement, and responsiveness. In certain freestyle boards, use of innovative materials such as basalt fiber for its extra strength and damping properties – as well as its milder environmental impact compared to fiberglass. Use of cork for vibration damping, extra moisture resistance, and low abrasion grip for dancing and boardwalking. Innovative wheel flare design that serve not only for wheel clearance but also form part of the board’s overall shape and response points for carving and tricks. 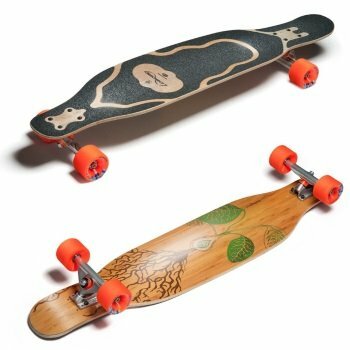 In short, Loaded has a unique value for longboarders in terms of shapes (directionality, curvature), flex (carefully designed and implemented flex for each style, multiple flex options), concave (for versatile riding, see later), and complete setups. Speaking of setups, Loaded completes always ship with premium components including Paris or Carver trucks and Orangatang wheels, Loaded’s own line of quality longboard wheels. All these brands are highly-regarded standalone and offer quality products that longboarders often choose when assembling their own custom longboards. The Loaded lineup is relatively small compared to other leading longboard brands such as Landyachtz. At the time of this writing, there are no more than 14 Loaded models offered, each with a very specific personality, a strong reputation among riders, and a history of solid performance – some have become “household names” in the longboarding community. All of Loaded’s longboard models are designed for versatile riding, a lot of them making great all-around boards. Of course, this kind of statement is not going to help you much if you’re facing the task of choosing a specific model for yourself! Fear not, my goal in this article is to help you sort things out and narrow down your choices. 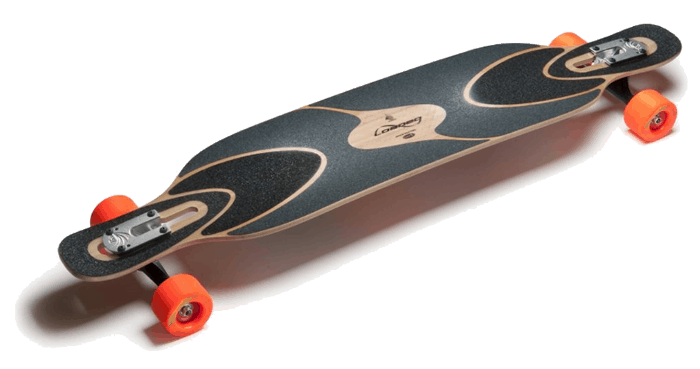 Loaded has designed each of its longboard models with one or two primary riding styles in mind such as carving, pumping, freestyle, dancing, freeride and downhill. More about this shortly. One question that often comes up is, what about cruising? Cruising typically refers to easy riding and often combines several riding styles including carving, pumping, and perhaps some sliding. So if you’re looking for the best Loaded longboard for cruising, look for the carving, pumping, and/or freeride-oriented boards in the lineup. To help sort out the boards I have created a chart that recaps the main features and style focus of each board. Click on the image to see it full size. The first obvious question you need to ask yourself when selecting a Loaded board is, what is my primary riding style. Is your goal for this board essentially kicking around the city? Traveling by pushing and pumping over distances? Freeriding and sliding on smaller hills? Bombing bigger hills at high speed? Doing some advanced technical riding, freestyle tricks, or park and pool? Dancing and boardwalking? Let’s apply some filters to narrow down our options based on target riding style. Note that, if your main focus is on pushing and commuting, you may wonder where your style fits here. The above categories are only the first step though, keep reading for more selection criteria. The next criterion you want to apply is board size. 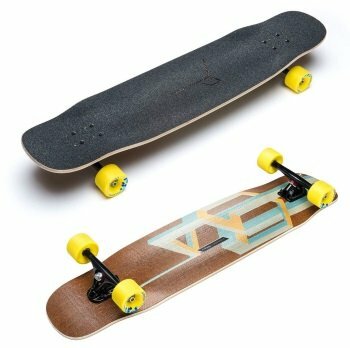 How stable vs portable a board do you want? Will you be carrying it a lot? Of will you be driving to riding places? Are you looking for a Loaded board with a larger wheelbase for dancing, speed, or commuting? 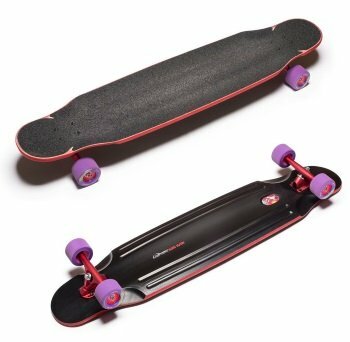 So at this point, say you need a smaller board for slashing around the city but you want to carry it around with you all day and stash under your desk. You might choose either the 34″ Poke or 31″ Kut-thaka depending on your focus – Poke for city carving, Kut-thaka for more flips and tricks. The next most important selection criterion has to be mount type: do you want a topmount or a drop-through board? In short: topmounts are more responsive and better for tricks, but harder to push on and less stable at speed. Drop-throughs are easier to push and commute on, more stable at speed, easier to break into slides, but less responsive and nimble. Note: after reading the above paragraph, you may find it a bit confusing that a board like the Loaded Truncated Tesseract is primarily meant for speed even though it’s topmount. However, changing certain variables in a board’s shape or construction can significantly change its behavior at higher speed. In this case, a stiff construction and a rockered shape can make a topmount like the Truncated Tesseract more speed-friendly than a flexy cambered drop-through like the Tan Tien. 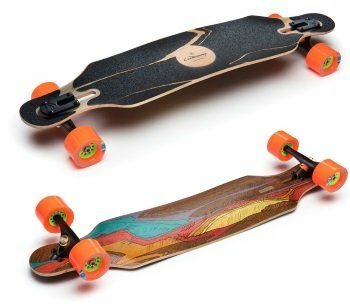 Back to the question of which Loaded board would work best for pushing and commuting, both the Icarus and the Tan Tien are mid-sized drop-throughs that make great boards for push traveling. Choosing one between the two requires considering additional criteria such as shape features. Once you’ve narrowed down the target riding style, board size, and mount type for your Loaded board, it’s time to pick the best deck shape for your needs. There are 2 basic types of shape, symmetrical and directional. Symmetrical shapes are generally meant for freeriding and freestyle tricks since they allow you to ride switch more easily and generally have a kicktail and nose. Directional shapes are better-suited for commuting and for speed. Another important shape aspect is wheel cutouts. In cutout shapes, the wheels stick out from beneath the deck (vs tucked under it). This allows high wheel clearance for deep turns (carving, freeride) but can be a problem for freestyle or speed riding as there’s a higher risk of touching a wheel with your foot. The last aspect I will touch upon in terms of narrowing down the Loaded options is flex – other aspects such as concave and width should also be factored in but I’ll discuss these in the board lowdown section below. Besides board shape and ride height, flex can be an essential aspect of how a board feels and whether it’s a good fit for your specific style. Flexy boards give you more rebound when carving and can add efficiency to your turns. A bit of flex can also help absorb shocks and make distance pushing and commuting more comfortable and effective. On the other hand, too much flex can make a board less stable at higher speed and less performant for freestyle kick and flip tricks. At this point you probably have a better idea of what you need, and you may have a shortlist of Loaded boards you’re interested in. To complete this review, let’s take a quick look at each of the boards and any additional aspects not covered in the above criteria. Note that I’ve ordered the boards by length. Some of these Loaded boards have their own review on this site, so feel free to dig deeper where that’s the case. The 31″ Kut-thaka is a shorter version of its ancestor the Kanthaka. It’s a capable city commuter designed for city carving and slashing. It’s very portable and stashable. It offers a big tail and small nose for tricks, a stiff deck fit for tricks, and special concave for commuting comfort and easy tech sliding. In short: a small, lightweight board for carving, short city commutes, and street tricks. See my full review here. The 33″ version of the Tesseract is primarily designed for downhill racing and speed. It has a stiff deck with subtle concave, rockered profile and raised edges that combine to create foot pockets to cuddle your feet at high speed. The relatively long wheelbase also provides stability at speed. The wheel flares also offer important reference points when going fast. In short: a board built for speed, comes with a pure downhill setup. See my full review of the Tesseract here. The Poke, like the Kut-thaka, is a city cruiser and slasher, albeit slightly bigger and more comfortable for longer city runs, and with a bit more flex. Its rocker and mild concave provide good grip for carving. It’s directional shaped but the ample tail and decent nose make it trickable and slideable as well. The Poke is also a capable board for pool and park. In short: a capable, lightweight, slightly more comfortable city cruiser for slashing, carving, and freestyle tricks. Check out my full review here. The 36″ version of the Tesseract is a hybrid freeride/freestyle board. Like its little brother, it’s primarily built for speed with its stiff deck, rockered concave and flares that offer a secure feel when going fast, inviting you to slide. Meanwhile, the adjustable wheelbase and wide kicktail (but no nose) allow for some nice kick and flip tricks. In short: a board for fast and technical freeriding as well as some freestyle. See my full review of the Tesseract. 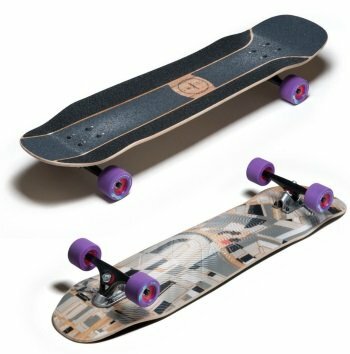 The 37″ Overland is another freeride and freestyle board with a moderately stiff deck for speed and a large kick and steep nose for tricks (ollies, manuals, shuvits, kick turns). Like the newer Tesseracts, it has a rockered profile and a mild concave for comfortable freeriding and sliding. The narrowed waist and Carver truck setup option also make it a good surf carving choice. In short: another board for fast and technical sliding + some freestyle, sized in between the Tesseracts. Also a capable surf-style carving board. See the Overland page on the Loaded site. The 38″ Fattail is a topmount with a cutout shape (wheels stick out), a cambered profile and a flexy deck. The camber and flex are meant to provide rebound and energy when carving and pumping. The large wheel clearance allow for deeper carves. The small tail and nose help for kick turns and mellow freestyle and dancing tricks. In short: a board primarily designed for carving and pumping on flat ground. Also has a dancing setup option with wider trucks. See the Loaded page for the Fattail. The Vanguard is similar in riding style to the Fattail as it’s also a topmount cutout shape with camber and high flex for energetic carving and pumping. Its shape also gives high clearance for deeper carves. Compared to the Fattail, the 38″ Vanguard has additional sidecuts (tapered waist) which give you more control and responsiveness for carving transitions and turns. It also has a more lightweight construction. In short: another high flex, responsive carving and pumping board. Two sizes (38″ & 42″) and 5 flex options (lower to higher). See the Vanguard’s page on the Loaded website. NOTE: for a discussion of Icarus vs Tan Tien vs Vanguard, read the comments in my Icarus review post. The 38.4″ Icarus is a technical symmetrical drop-through with wheel cutouts designed for hard carving and pumping. The drop-through design, advanced multidirectional flex, and special concave and rail contours give it a specific and innovative riding experience, namely for pumping. In short: an advanced carving and pumping longboard. The drop-through construction and the flex also make it easier to push on. See my full review. The 39″ Basalt Tesseract is a symmetrical freeride/freestyle hybrid topmount shape (no large wheel cutouts). Despite it’s size, it’s a very responsive board due to a relatively small (adjustable) wheelbase, a stiff deck, and large dual kicks for quick turns and freestyle tricks. The W concave and wheel flares give you comfortable lock in for sliding at speed. 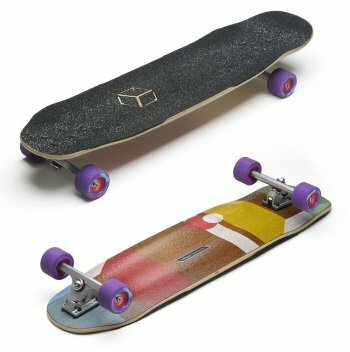 In short: a good choice for going fast and sliding with a comfortable and secure feeling, and for doing traditional longboard freestyle tricks. See my full review. 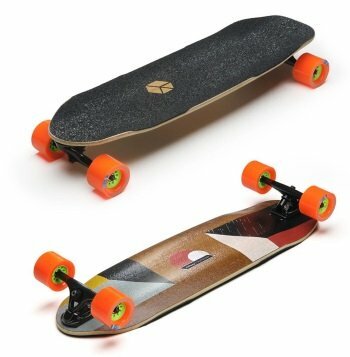 The 39″ Tan Tien is a long-standing, highly-regarded Loaded lineup staple. Like the Icarus, it’s a flexy drop-through, though with larger kicks for freestyle. A very versatile and responsive board that can be used for freeriding, longboard tricks, carving and pumping, and push commuting. In short: a classic carving, freeride, and freestyle drop-through board with a flexy cambered deck, big wheel cutouts for deep turns, and a comfortable concave for speed riding. Check out the Tan Tien page on Loaded’s website. This awesome-looking 42.25″ symmetrical freeride/downhill topmount is designed specifically for speed. It offers nice lateral support for sliding and high-speed cornering through its comfortable W concave that spans the entire deck. The board’s angled truck mounts make it lower and more stable at speed. The twin kicks are great for sliding and kick tricks and the grab rails support pre-drifting and grab tricks. In short: the Chubby Unicorn is a legendary, high-end & high-tech speed board, the priciest in the Loaded lineup. This board is for serious freeriders and racers. Check out the Blood Slayer’s page on the Loaded site. 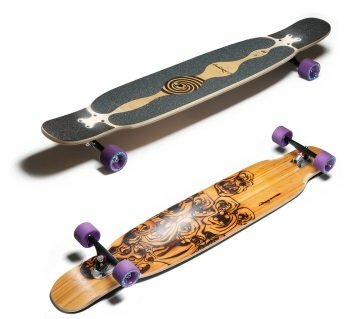 The 42.8″ Dervish is the largest drop-through and another long-time staple in the Loaded lineup. 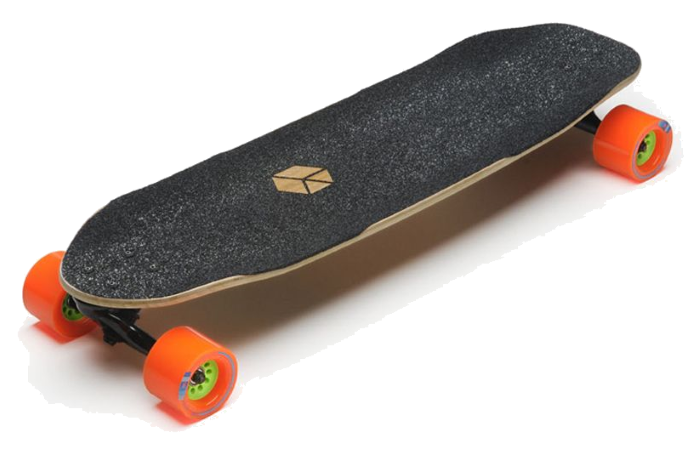 It’s similar to the Tan Tien, only bigger. Large wheel cutouts for deep carving, cambered and flexy deck for high energy response, low-riding drop-through trucks for stability and pushability, kicktail and nose – albeit smaller than the Tan Tien – for trickery and quick turns. 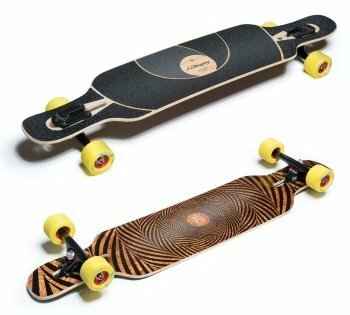 In short: the biggest (yet lightweight) Loaded longboard for comfortable and responsive pushing, carving and distance commuting. Also makes a very good dancing board due to the flex, moderate kicks, and mild concave. See the Dervish Sama page on Loaded’s site. The 47″ Loaded Tarab is often considered one of the best dancing longboards out there. This symmetrical topmount is first and foremost optimized for boardwalking and cross-stepping. The large roomy foot platform, flat-ish kicks, and mildly grippy cork top layer provide a very supportive dancing platform. The deck’s highy durable, lightweight, and damp construction, along with the reinforced kicks, allows for advanced freestyle tricks. 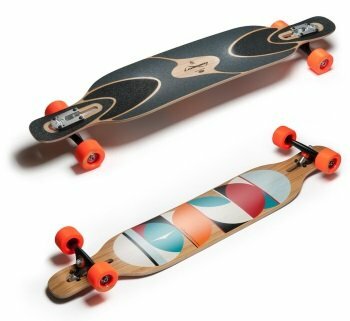 In short: the Tarab is a top choice for dancing and classic longboard freestyle. It’s also a great board for comfortable distance commuting. More about the Tarab in my complete review. The 48.5″ Bhangra is the largest board in the Loaded lineup, and the Tarab’s predecessor as a dancing and freestyle board. It’s also a symmetrical topmount with wheel cutouts and comfortable flex (slightly more than the Tarab). 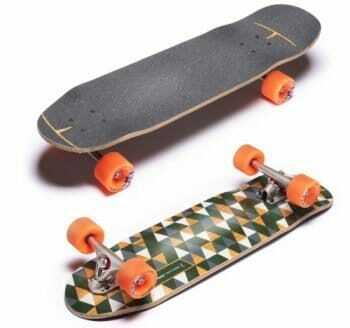 It has large angled twin kicks for tricks. Like the Tarab, the Bhangra boasts a durable hybrid bamboo construction and mild concave for footwork. It has strong grip between the trucks to support carving and sliding. In short: the Bhangra provides the roomiest platform for dancing and freestyle. It’s also a great longboard for classic carving and road surfing. Here’s the Bhangra’s page on Loaded’s website. 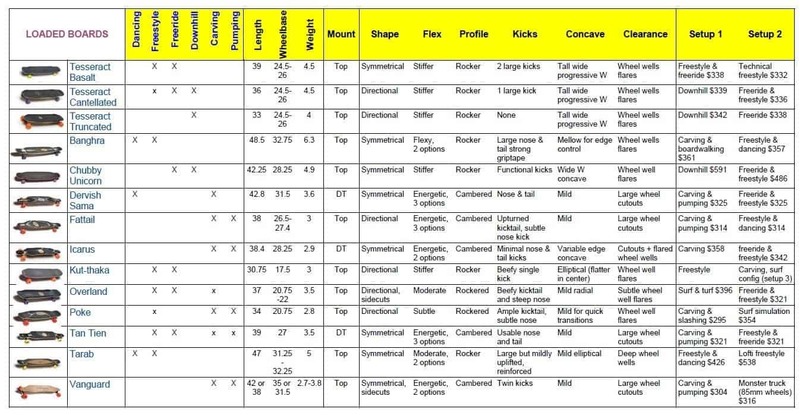 So if you went through this extensive Loaded Boards comparison guide, I hope you’ve found it useful. Loaded is truly a premium longboard brand with products that always aim to push the limits of build quality, ride comfort, and technical features in a performance longboard. While many Loaded boards are highly versatile and great all-around boards, each board in the lineup has a distinctive personality that makes it a compelling choice for a specific style or combination of styles. You’ll see Loaded longboards mentioned in many places in this site, simply because they’re among the best. Check out my in-depth reviews of specific Loaded models.